Hawaii Native Status: Introduced. This naturalized food plant is native to the eastern United States. Description: The flowers are in short, open clusters on the lateral branches of the floricanes (second-year flowering and fruiting canes). The individual flowers are 1 to 2 inches (2.5 to 5 cm) across and have 5 white, egg-shaped petals and 5 small, hairy, green sepals. The flowers are followed by red ripening to black, round to oblong, 3/4 inch (2 cm) long berries. The leaves have prickly petioles and midribs and are dark green and almost hairless above, paler green and softly hairy below, and palmately compound with 3 or 5 deeply veined, elliptic, oblong-oblanceolate, or egg-shaped leaflets with coarsely and irregularly saw-toothed margins. The primocanes (first-year non-flowering canes) have larger leaves than the floricanes. The canes (stems) are stiff, angled, sparsely to densely hairy, and covered with straight or hooked prickles. 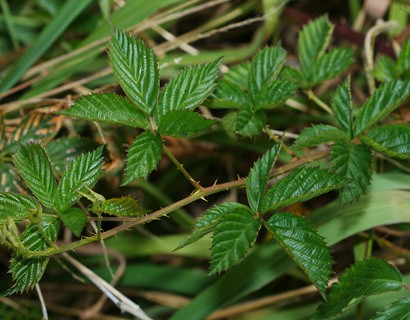 The plants are a thicket-forming bramble with stiff, arching stems that can take root where they touch the ground. Here in Hawaii, Sawtooth Blackberry is an invasive weed in middle to upper elevation, wet to mesic (moderately wet) disturbed areas and open forests. Birds are responsible for spreading the seeds. 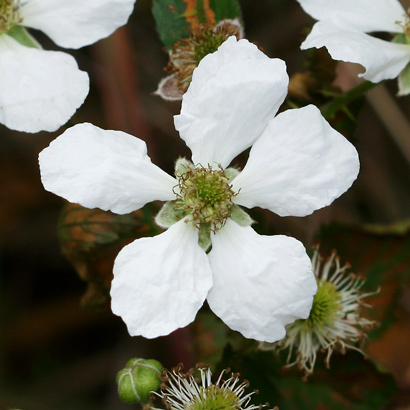 The very similar Himalayan Blackberry (Rubus armeniacus, formerly Rubus discolor) has white or pink flowers and leaves that are light greenish gray below. 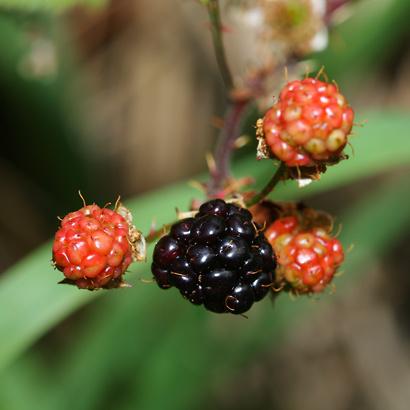 Edible – The black, ripe blackberries are edible, but they are very tart and taste better with a little sweetening or when mixed with other, sweeter fruit.